MJ: MJ here with MJ’s Hip Hop Connex and She Bloggin, and joining me is Jersey’s, East Coast, United States, and worldwide legend DJ Soulbuck! Salute, and thank you for your time. You have shared that music, Hip Hop, and the art of deejaying stem back to early on as a child. Your father a DJ and heavy into Disco, and your uncle also a DJ but more into the Hip Hop scene. Early on you were mesmerized and fascinated with turntables and mixing. Talk about the very first experience for you when your father and uncle introduced you into that world. DJ Soulbuck: Well my dad of course was heavy into disco at the time after he stopped his singing career. But memories I have of him is sitting in the room with me while he played music and would sometimes tape himself or show me records he was playing. I was always fascinated just by looking at the albums. My uncle would play tapes around me when I was about nine. I heard “Rappers Delight” but didn’t care too much for it but I heard a tape he was playing of Grandmaster Flash and he acted out what he was exactly doing and I was hooked instantly! MJ: Besides the genes, why else do you think your father took you under his wing and allowed you to deejay a family party at the age of 10? DJ Soulbuck: Well I was a fast learner. I tried to scratch on his turntables and broke a few needles and got my a** whooped for that lol. But one day he asked me if I wanted to try it. I said yeah and he showed me how to cue up records and bring them in. He even taped me so after that he was amazed I picked up so quickly and asked me did I want to help him deejay my aunt’s wedding. MJ: Talk about your teenage years when deejaying became serious for you and you began practicing religiously day in and day out. DJ Soulbuck: Well I didn’t have my real first dj set until my early 20’s. But my teen years I would practice on a record player and make pause cassette tapes religiously. I would tell people I knew how to deejay and people would laugh it off. One of my uncle’s was bragging about me one time to his friend who deejayed and brought me to his house. When he saw what I could do he remained very quiet while my uncle said I told you my nephew was nice! MJ: Share with us at what point in your life did the realization hit you that this was no longer a hobby for you? Talk about that moment when you knew this was now a career? DJ Soulbuck: When my son was born in 2005. I had always deejayed clubs and bars but I didn’t have any business sense. I was on some look fly sh*t and make money and rock the crowd. But then I met Doodlebug with Digable Planets and he dropped a lot of jewels on me plus I showed him my hard work ethic. MJ: Now I’m not sure if everyone out there knows the story on how you linked up with Digable Planets. But it was not you that did the reaching out! Tell everyone about that connection that ultimately led to a tour. DJ Soulbuck: I was attending The Art Institute of Philadelphia at the time majoring in TV/Video. I didn’t want to put deejaying on the back burner. I knew a group named Fine Arts show invited me down to their studio session at Sigma Studios and that’s where I met Doodlebug. He was recording and I showed up for a scratch and just to hang out. But I pulled him aside and told him I make beats and wanted to work on something. He gave me his info and the rest is history! MJ: Although tour life is an important element for fan base, growth, and success in the industry, it is not as glamorous as it is portrayed. What was tour life like for you? Do you think you were prepared for it? DJ Soulbuck: I wasn’t, but I adjusted. It’s fun when you are on stage but the politics of the business can be stressful. Also the traveling and if you have a kid like I do you get to missing your kid. MJ: Take some time now to let everyone know about DJ Soulbuck’s services! It goes beyond only radio and showcases. DJ Soulbuck: I do mixtape hosting, scratch features, deejay sets at venues, deejay for artists, production, private parties, and tours. MJ: You are a veteran in this industry of music! You have experienced different things, seen different trends, heard hundreds of one hit wonders, etc. From a DJ’s point of view what are the major key factors for an artist to make a name for themselves? DJ Soulbuck: Every day is a day to move up in the ranks, there’s no days off. Be humble and build relationships with DJ’s even if they don’t jump on your record right away, somebody will and people will catch on. You need to have plenty of media for people to see, hit these streets, and perform anywhere. Of course have someone smart who can represent you. It’s a lot of hard work, no sleep, sacrifice, and dedication! It won’t happen by just tagging people on Facebook to share your music. MJ: I want to know your do’s and don’ts. Every DJ has them when it comes to artists and fans or listeners. DJ Soulbuck: My don’ts is simple, if you come with an arrogant approach it’s a big turnoff. If your presentation doesn’t look believable I can’t see the hunger in you. Another don’t is telling me how to play at a spot when I’ve been hired to dj, and lastly don’t overload me with requests, I like requests but timing is everything with each song. The do’s is definitely display good energy everywhere you go and make sure people remember you! 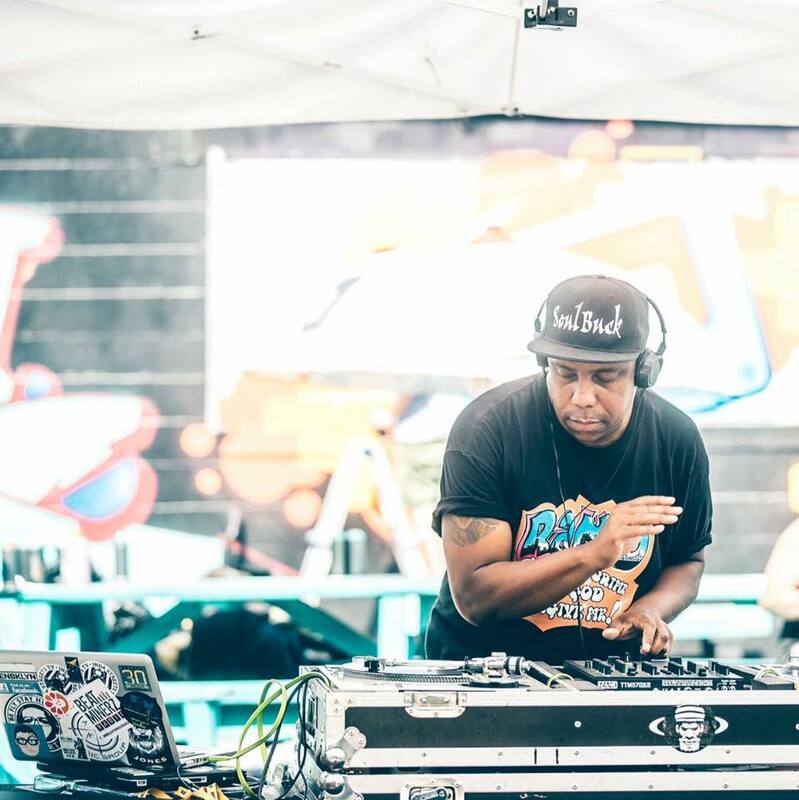 MJ: Besides being incredibly knowledgeable in the world of Hip Hop and the culture, being extremely talented, and a master on the wheels of steel, the one word that comes to mind when I think of DJ Soulbuck is humble! After decades and decades of working in the industry, touring, and deejaying for major artists what keeps you so grounded? DJ Soulbuck: My son keeps me from doing something really crazy and out of pocket. I was raised to be humble and modest. MJ: Lets shift a bit now. You are first and foremost a father, not a weekend dad but a father co-parenting and raising his son. Salute! What are some of those challenges? Also how do you balance family and your career? DJ Soulbuck: Very challenging! But I’ve managed to juggle it all for years now. I always tell my family this what I know and how to provide for everyone. It comes with its ups and downs but this is all I know. It’s rough but I manage to keep it moving. MJ: You have traveled across the globe and receive love from all over! Do you have a favorite place you have toured? In your opinion what areas show the most love, energy, and support? DJ Soulbuck: Toronto and Calmore in Canada, the love they showed me was amazing, from autographs to pictures. A lot of places I’ve been outside the tri state has showed so much love and it’s always different from home base. MJ: Try to put in words and describe that feeling of having so much control at the tip of your fingers! How does it feel knowing you are a platform for so many up and coming artists? How does it feel to be the first to spin an exclusive track or album cuts from an established or major artist? DJ Soulbuck: It’s a good feeling. But I also want the artist to feel good about themselves when I do play their music. MJ: I know you appreciate lyricism carried over a strong beat. Tell us some artists in your personal play list. DJ Soulbuck: Conway, Westside Gunn, Benny, Drama Sinatra, Stevie Franks just to name a few. MJ: In the eyes and mind of DJ Soulbuck, what is defined as Hip Hop? Why is it important to you to live a lifestyle true to the culture? DJ Soulbuck: Because Hip Hop is a culture and people have it confused. It’s a lifestyle, not just rapping. Rapping is just one of the elements. You have to live, sleep, breathe, and eat this! MJ: Let’s talk radio shows form UTM Radio to BeatMinerz Radio. When and where can listeners tune in? Also do you have a preference between spinning at a live show or in a radio studio? DJ Soulbuck: It doesn’t matter as long as people enjoy the music. I’m on UTM Radio every Monday night from 9pm-12am on the syndicated show IIour Show Uncut. On Thursday’s you can find me on Beatminerz Radio from 4-6pm. Occasionally on Side B Radio with Phil Jackson on WPRB 103.3FM, Princeton NJ. MJ: How different would your life be without music, without turntables, and without vinyl? DJ Soulbuck: I don’t even know I’d probably be an artist because I used to love to draw. MJ: What knowledge can you pass along to those practicing the craft of deejaying? DJ Soulbuck: Study the essence of it even if you are doing it your own way you need to do your research on the pioneers who paved the way. Respect it! That’s what I did. Also study all genres of music because it will make you very well rounded and versatile. MJ: I’m curious about the influences in your life, personally and in your career. DJ Soulbuck: Well my dad and uncles. We got Grandmaster Flash, DJ Cash Money, DJ Jazzy Jeff, DJ Scratch of EPMD, Jam Master Jay, Red Alert, Marley Marl, and two of my closest DJ friends Kid Swift and DJ Doodles. MJ: As we wrap up, is there anything else you would like the world to know about DJ Soulbuck? DJ Soulbuck: That I am a DJ that represents the art form of deejaying, no gimmicks, no follower bullshi*, and no trendy nonsense, just me! MJ: Thank you again for taking the time out for MJ and She Bloggin, salute!